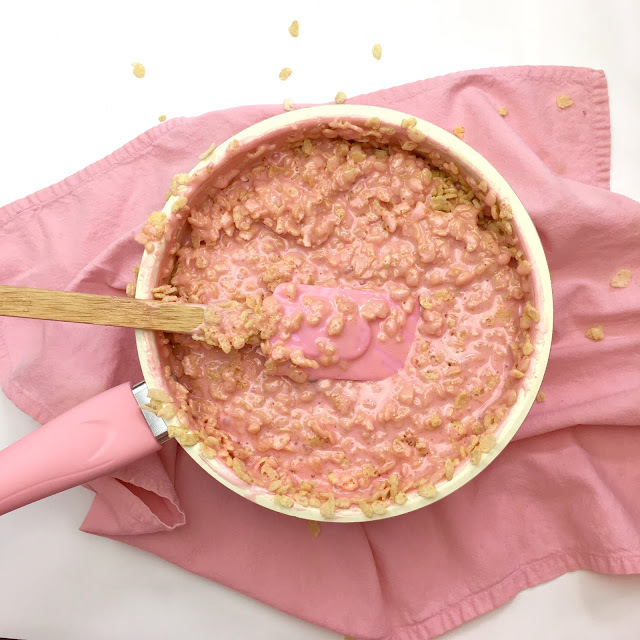 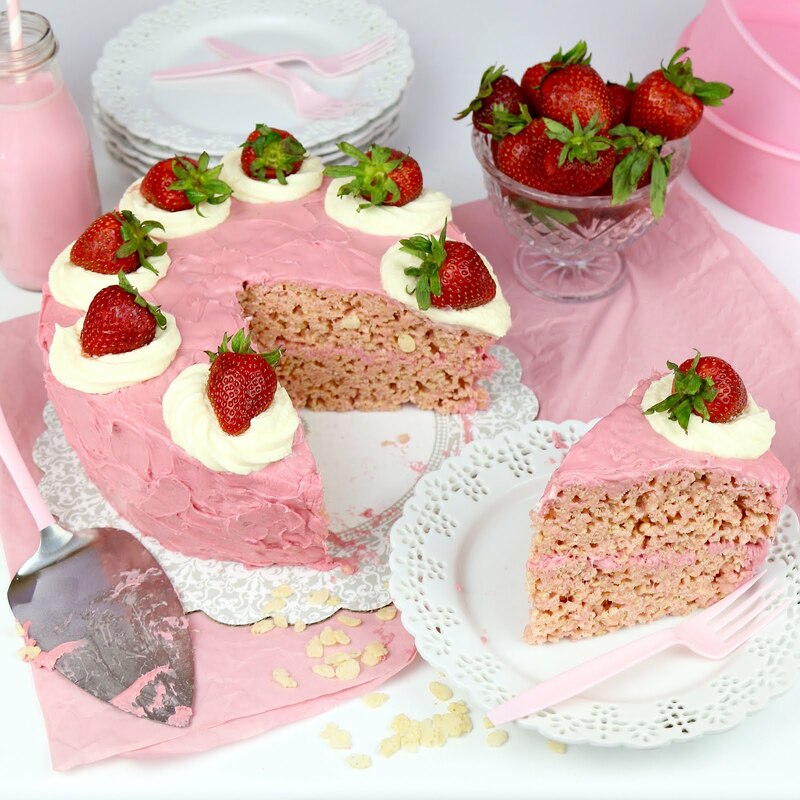 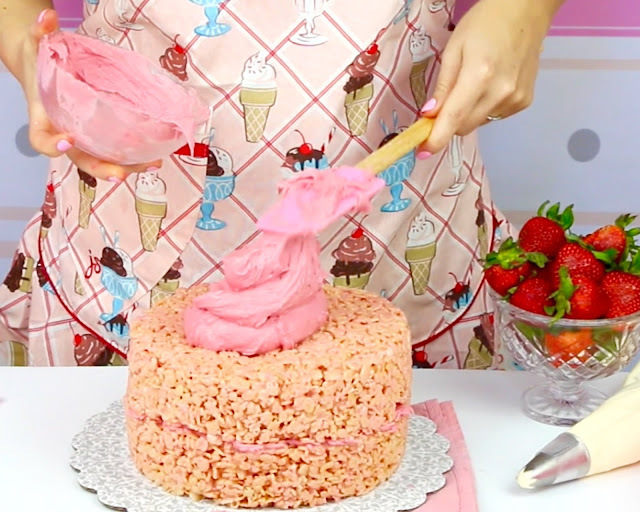 Two layers of strawberry milkshake flavored, marshmallowy rice cereal treat, smothered in a sweet and creamy strawberry milkshake frosting to look just like a real cake! 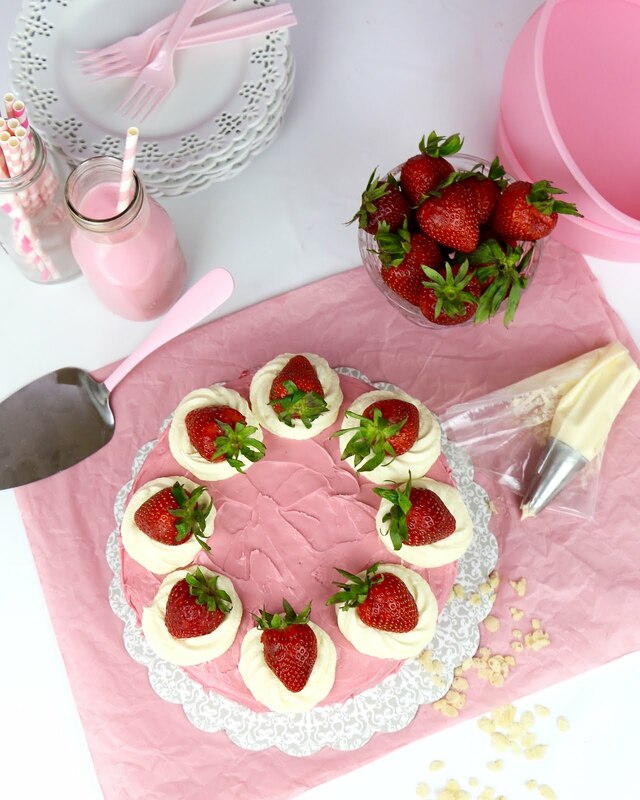 Topped off with fresh strawberries, this is the perfect no-bake summer dessert, perfect for picnics, BBQs, birthday parties or any summer get together. 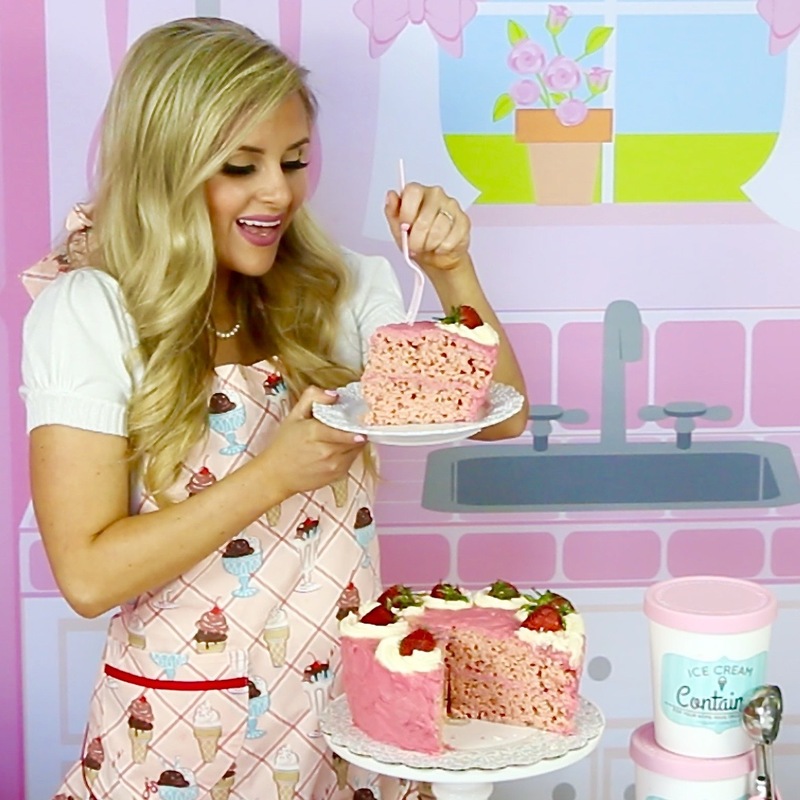 This cake looks so real and is so much fun to cut into as everyone is completely blown away by the surprise inside! 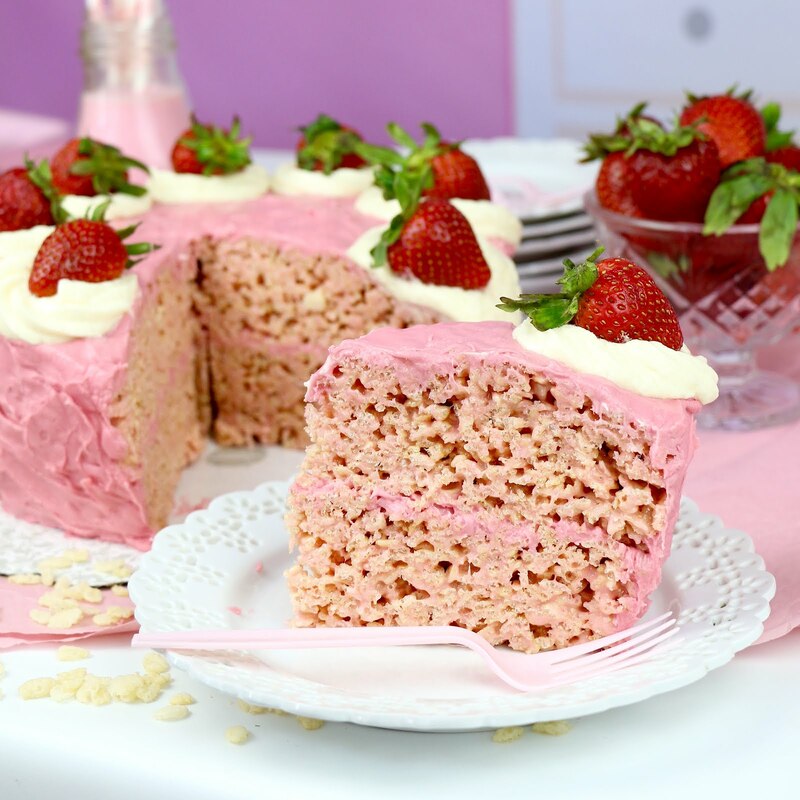 The super soft, ooey, gooey marshmallow crispy cake is flavored with strawberry flavored milk powder for a really fun, fruit twist, that pairs perfectly with the frosting that tastes just like a strawberry milk shake! This cake comes together so quickly and the no-bake recipe allows you to whip it up in no time, without having to turn on the oven. 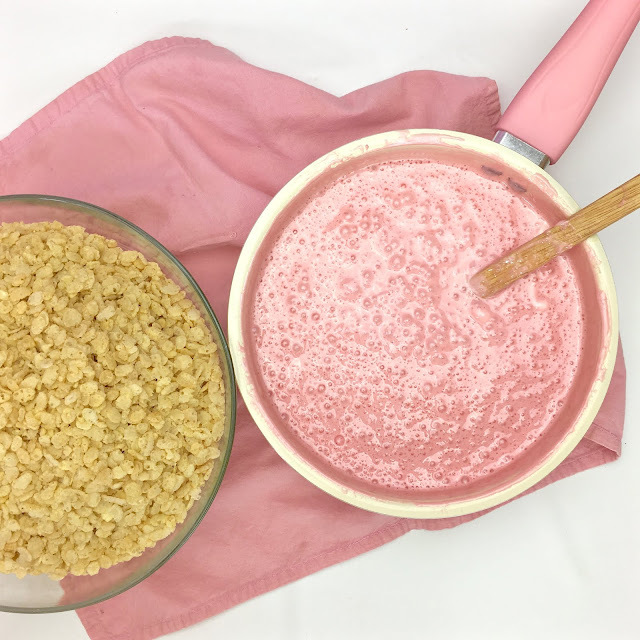 All you do is prepare some rice cereal treats with my secret ingredient, strawberry flavored milk powder to make it taste like a milkshake! Then, press it into shape using some cake pans lined with plastic wrap. 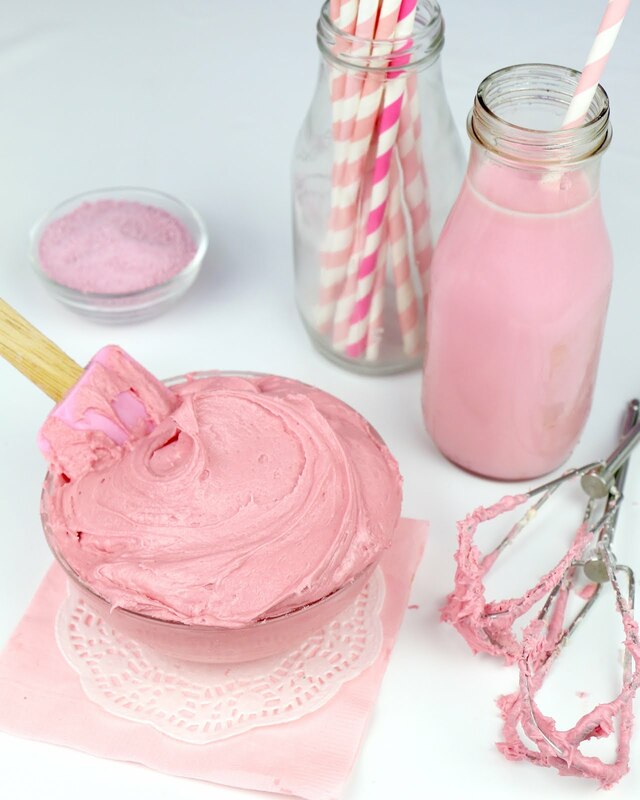 While the crispy treat cakes cool and set into shape, make the strawberry milkshake buttercream frosting. 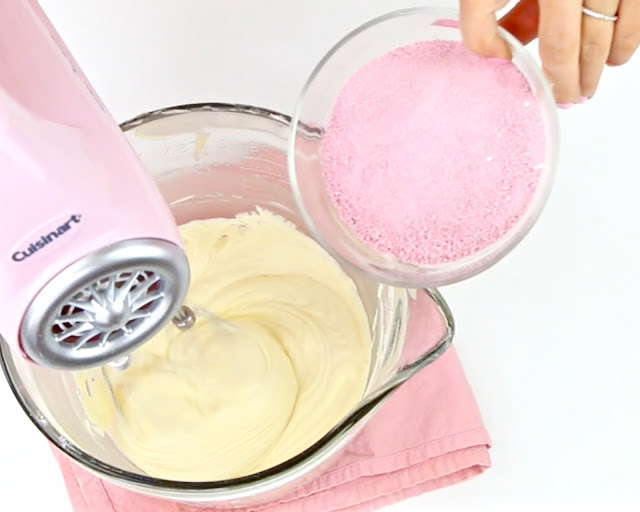 The strawberry milk powder really transforms my classic vanilla buttercream, into a strawberry milkshake cloud of fluffy, smooth, creamy perfection! 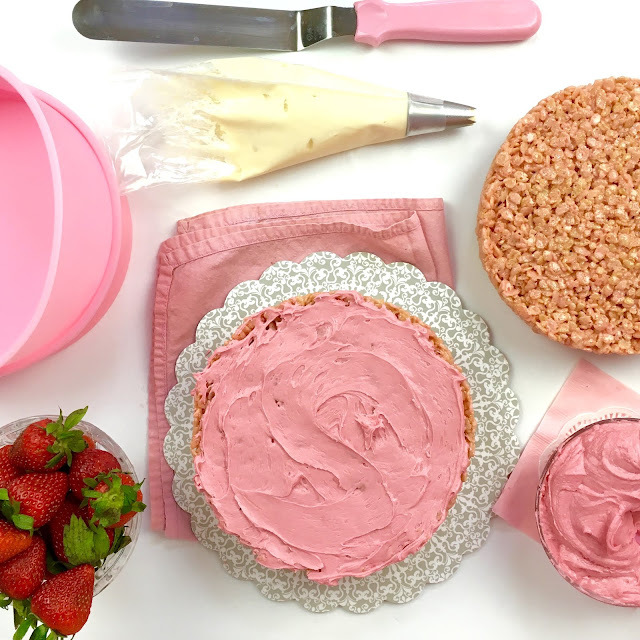 When everything is ready, just assemble it like a regular cake! 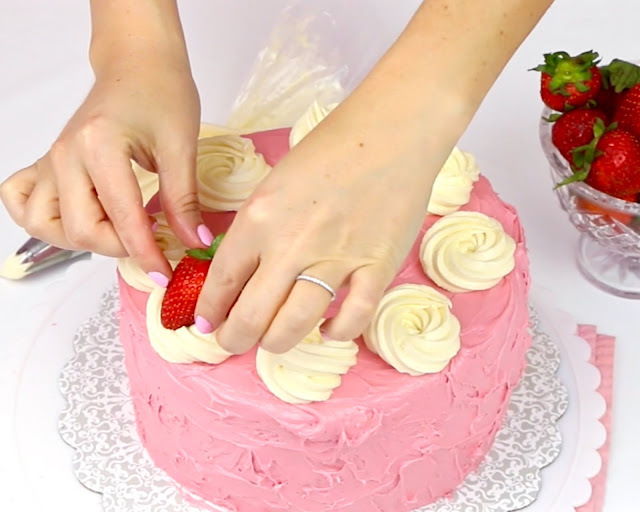 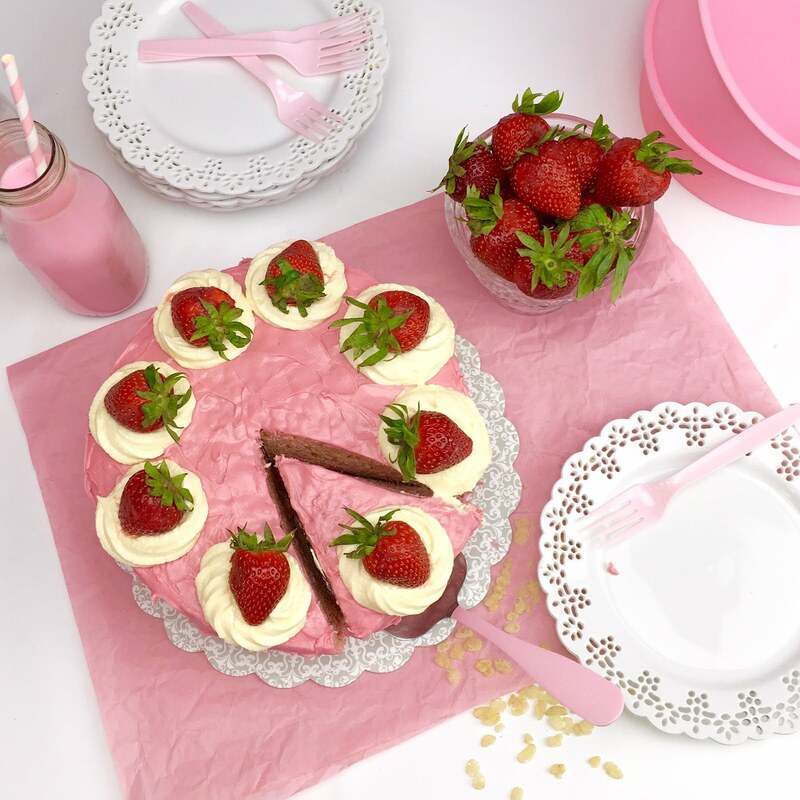 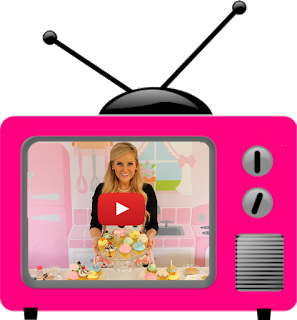 Top it with some swirls of the frosting and fresh strawberries to look like a real cake! 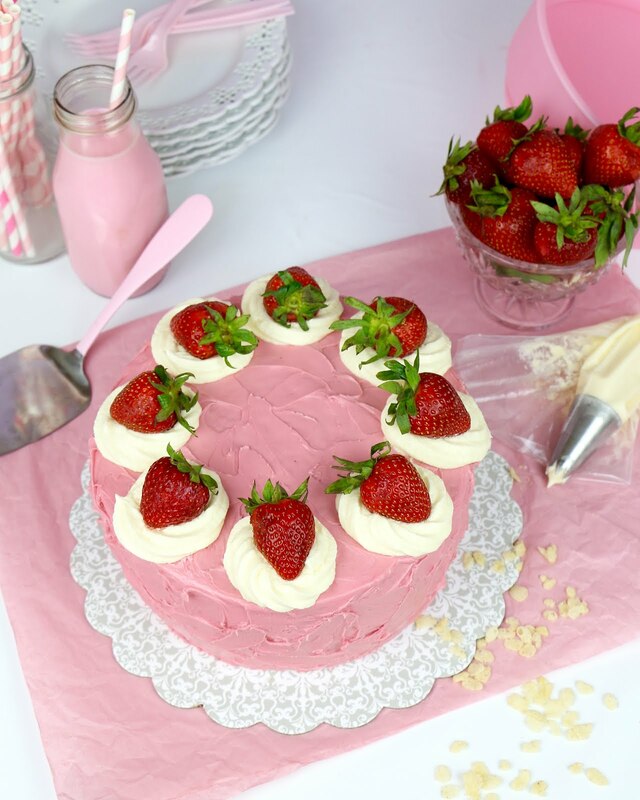 Slice and watch everyone's surprised face when they see what is on the inside ;) You can get creative and even try this with chocolate milk powder or vanilla malted milk powder instead to create all different kinds of flavors! 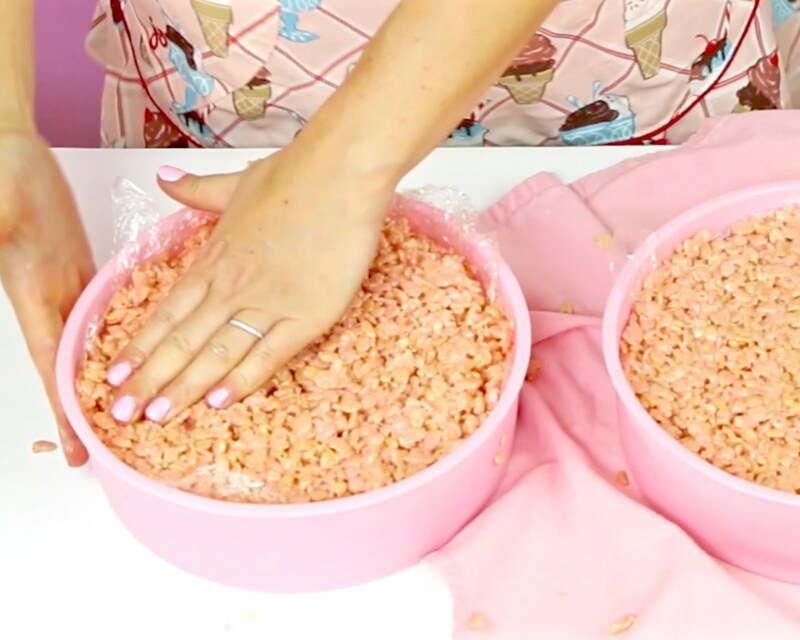 Line two 8-inch round cake pans with plastic wrap and spray with non-stick cooking spray. Melt butter over low heat in a large saucepan. 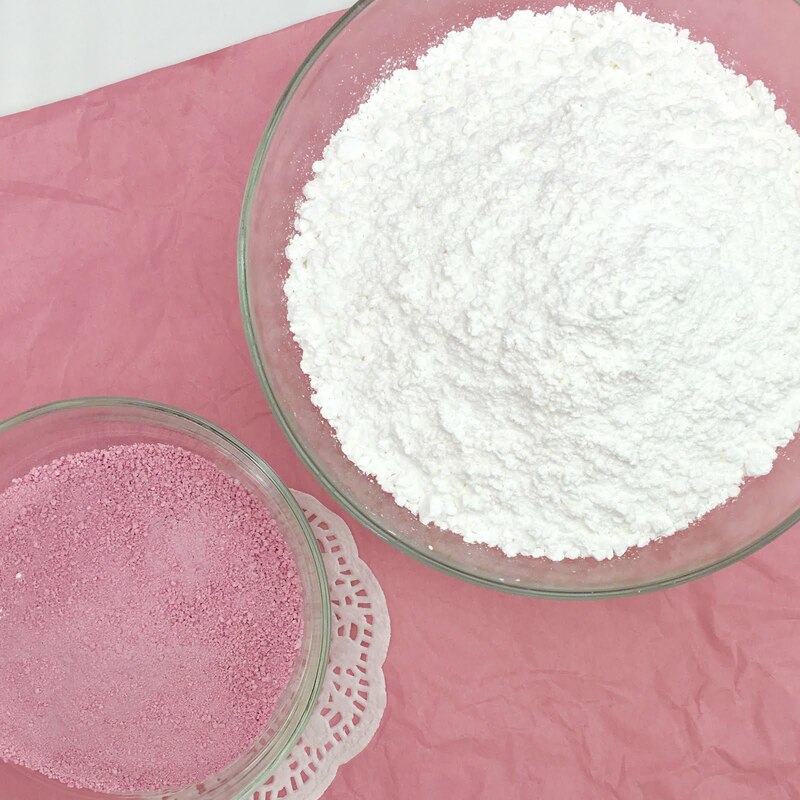 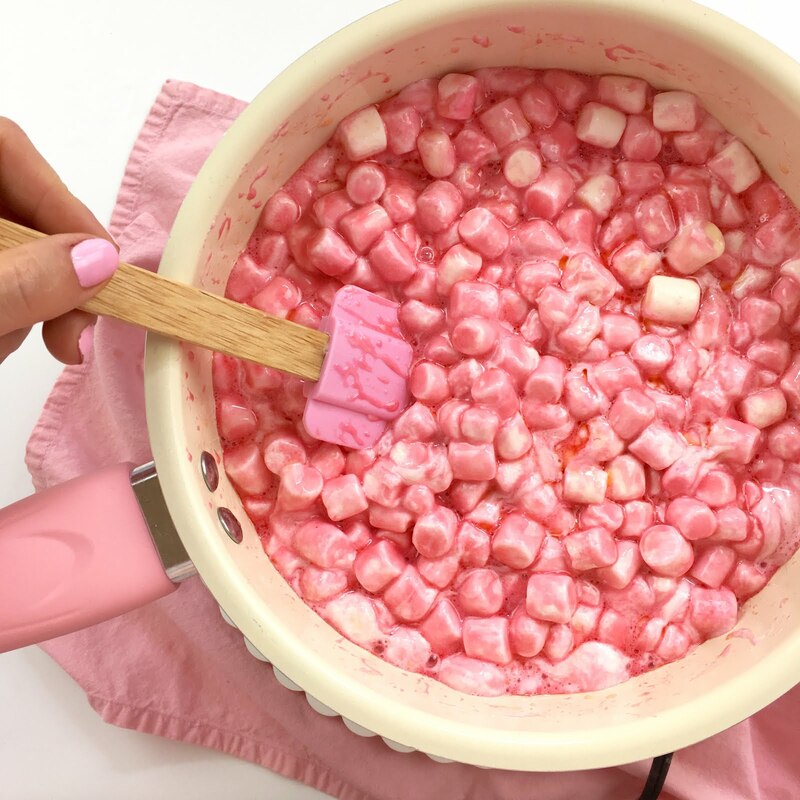 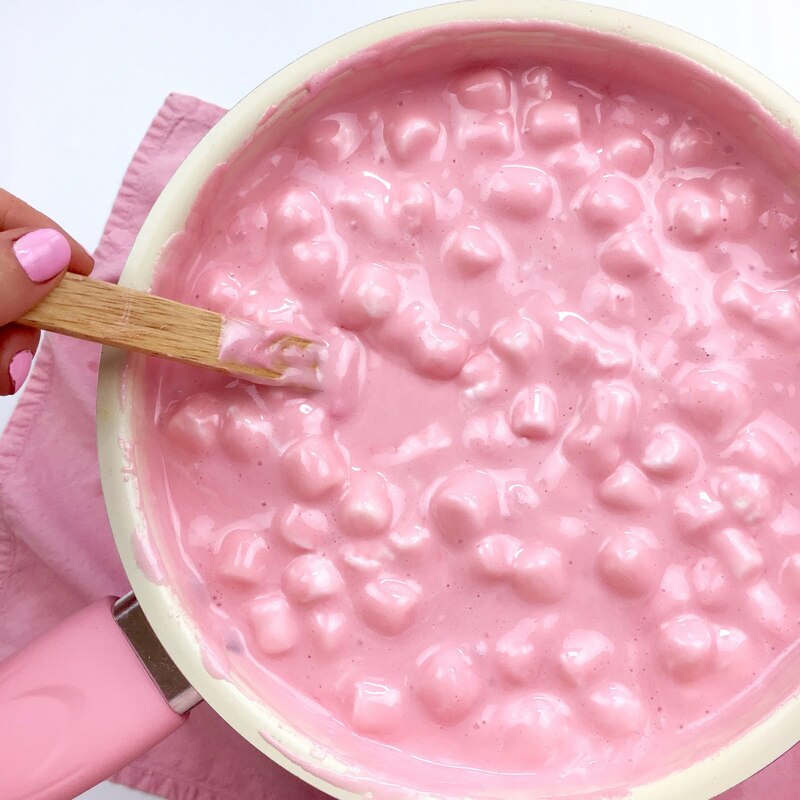 Stir in strawberry milk powder, 5-7 drops of pink food coloring and marshmallows, until fully melted, about 6-10 minutes. Turn off heat and stir in cereal, transferring mixture to a large bowl if needed. 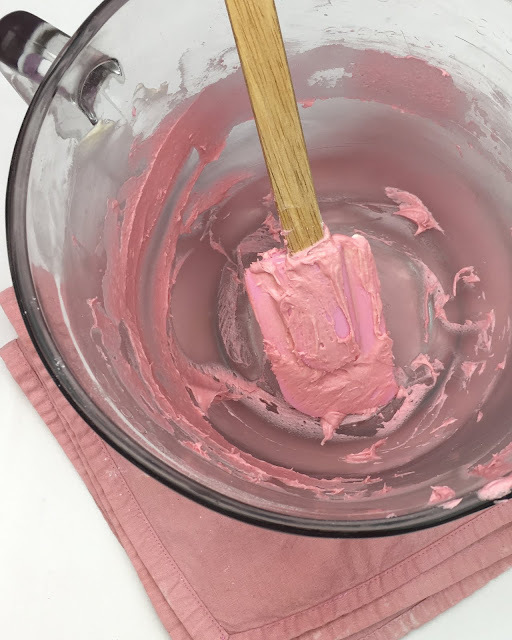 Divide the warm mixture between the prepared pans, pressing down with greased hands or spatula until flat and level, making sure it gets into the corners of the pan. 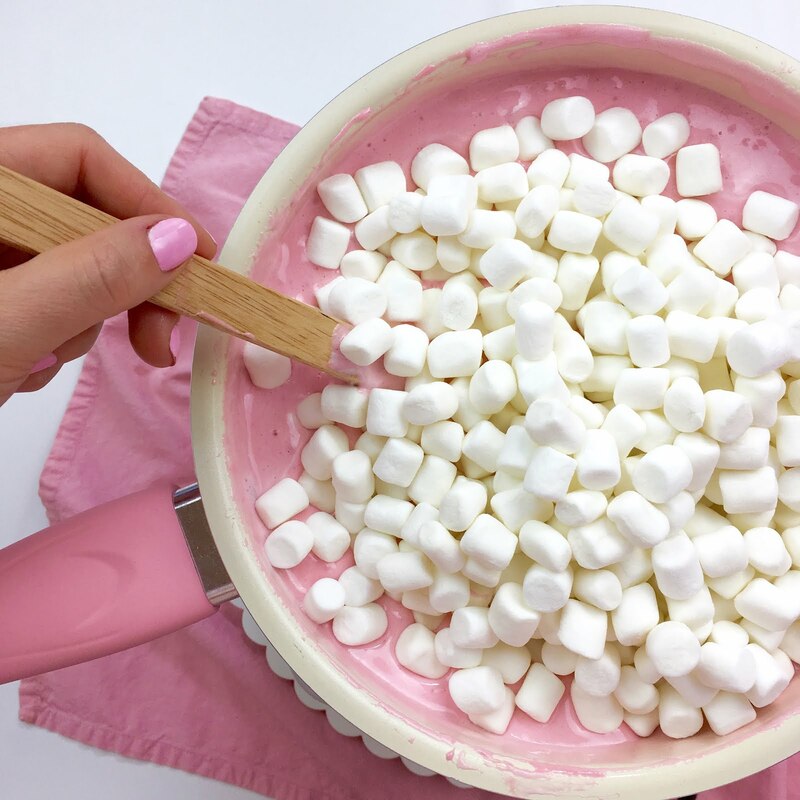 Let cool until set, at least 30 minutes while you prepare the frosting. 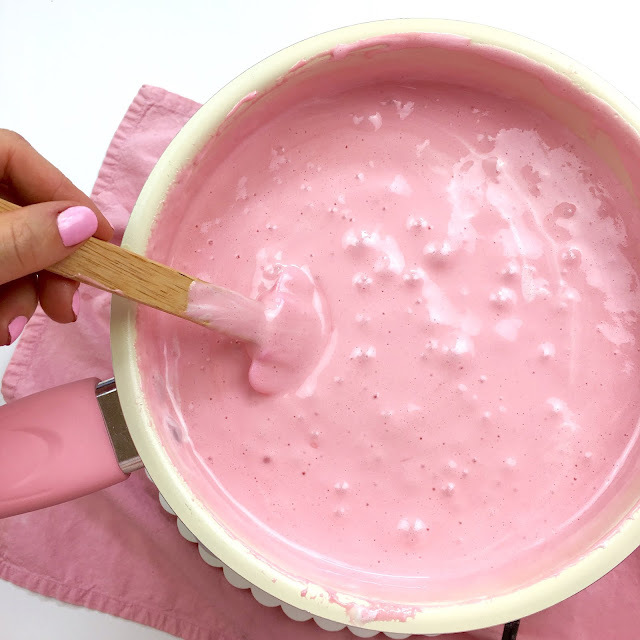 With an electric mixer, beat the softened butter on medium-high speed until smooth, creamy and pale in color, about 2-4 minutes. Beat in vanilla and salt. 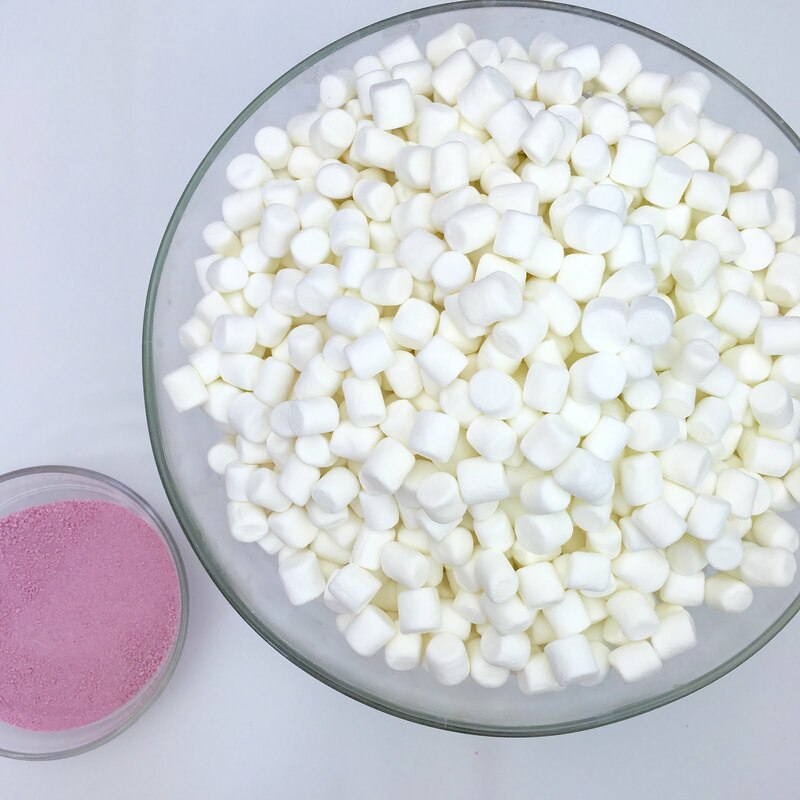 Add the powdered sugar 1 cup at a time, starting on on low and increasing the speed until fully incorporated. 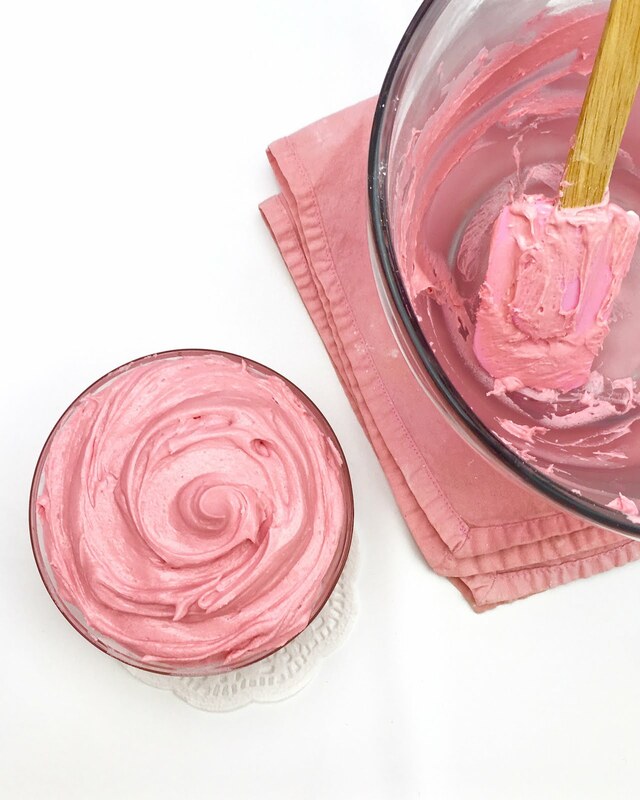 Add cream, 1 tablespoon at a time, until desired consistency is reached. Increase to medium-high speed and beat for an additional 3-5 minutes until smooth, light and fluffy. 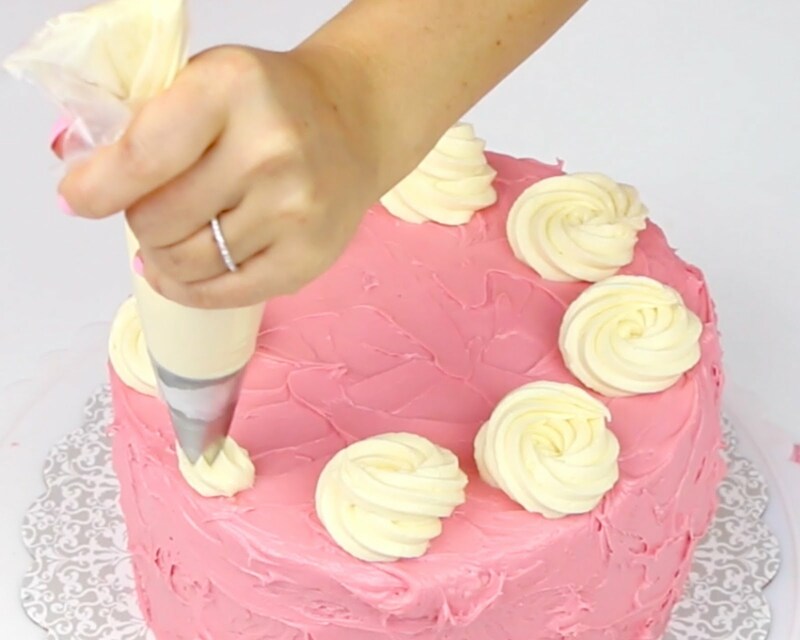 Set aside about 1 cup of the frosting, into a piping bag fitted with an open star tip, for the swirls on top. Beat in strawberry milk powder and a few drops of pink food coloring to remaining frosting, adding more cream as needed. 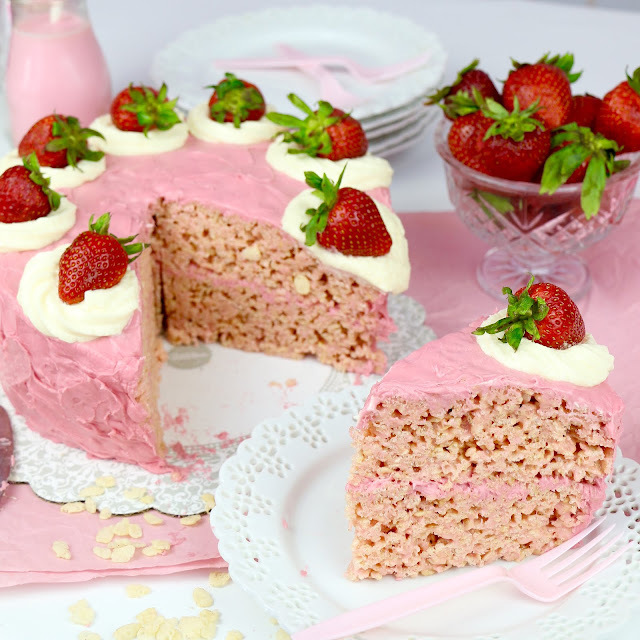 Place 1 crispy cake layer on a serving plate and spread a layer of the strawberry frosting on top. 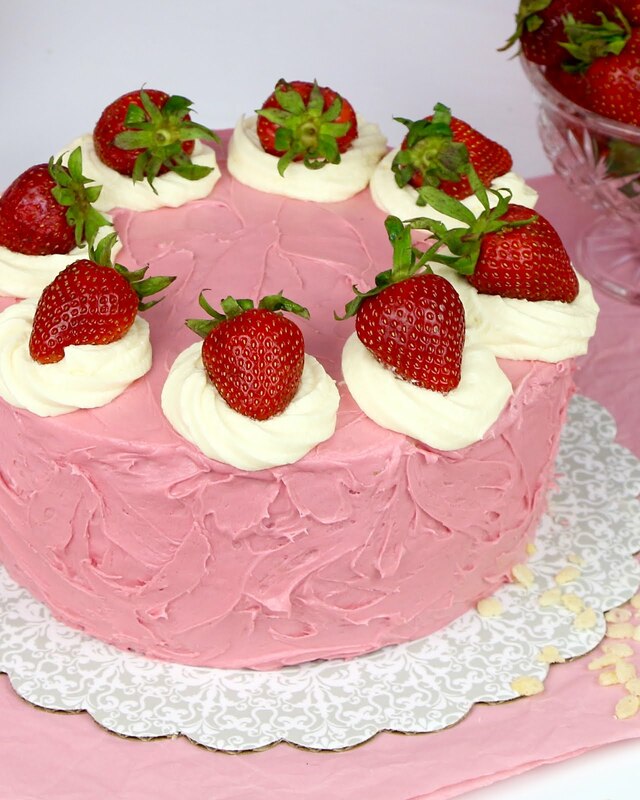 Place second cake layer on top, with the flat bottom facing up. 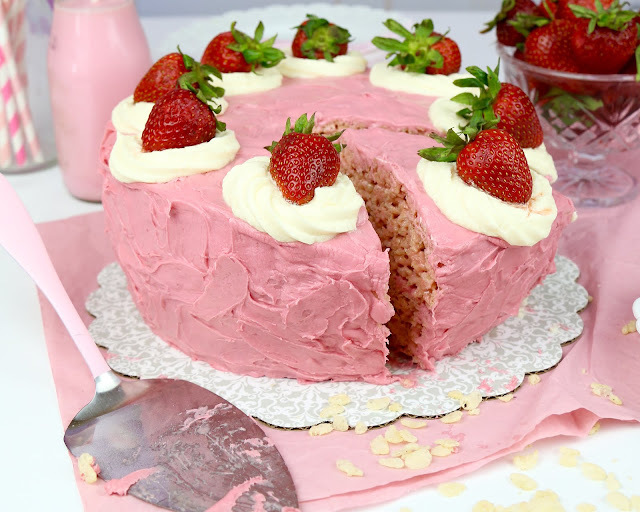 Frost outside of cake with the remaining strawberry frosting. 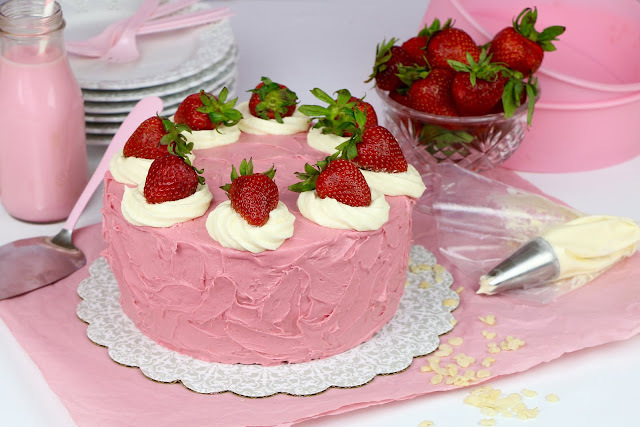 Pipe swirls or dollop the white frosting set aside, on top and finish with a fresh strawberry. 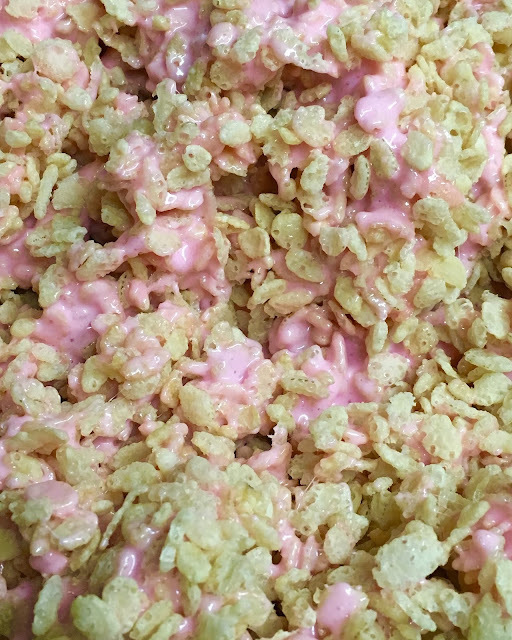 Serve and enjoy within 2-3 days.